← Ask and you shall receive? Yes, you read the headline correct – the Ferry Family has a new arrival. My bees have arrived! On Monday, Beckett and I drove down to Burlington (about 30 miles away) and picked up two boxes of honeybees. They are Italian – I call them my Italian lovelies. 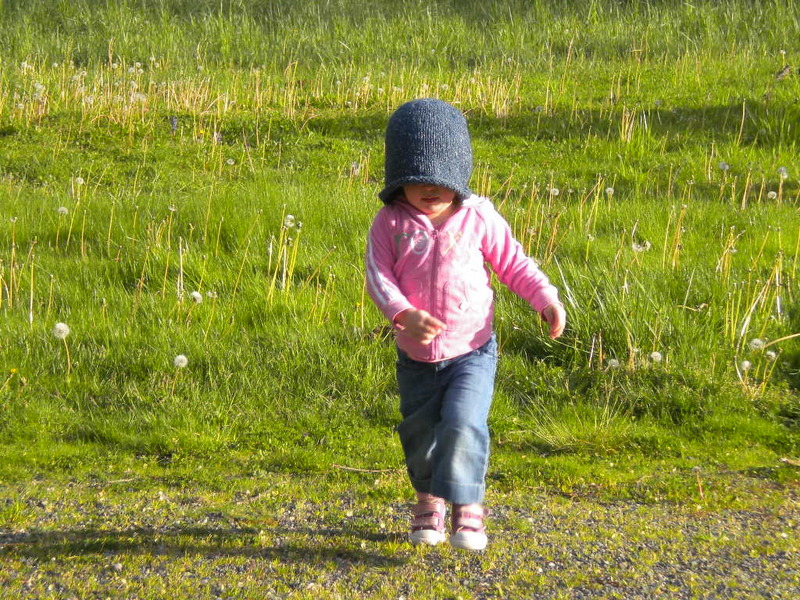 The trip home was filled with a monotonous, soothing drone intermixed with a toddler babbling “bees cute”. This is the first posting that focuses directly on my beekeeping adventures and the process of caring for them. My plan is to have it be an overview of how Monday went. How we prepared. What happened. And, where we are headed. 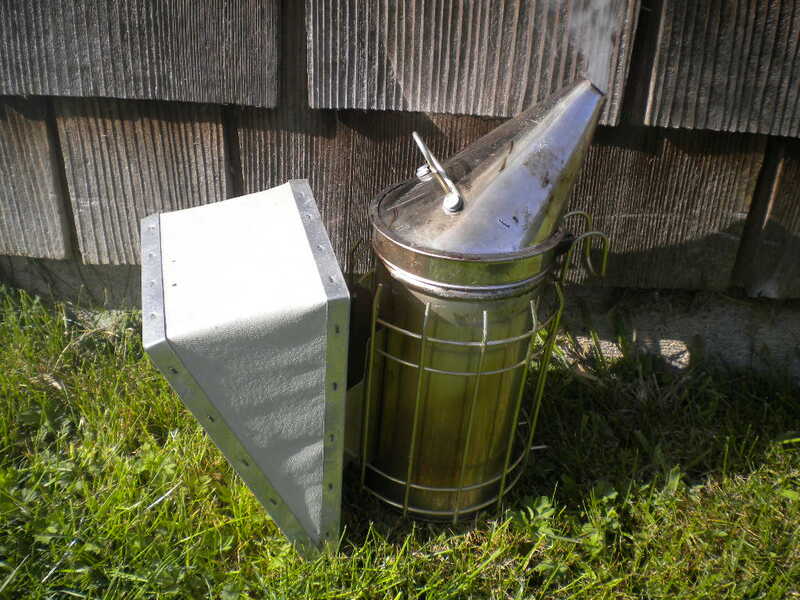 I’ll give you tidbits of beekeeping information, but if I don’t explain something well enough or you are left scratching your head and wanting more – please leave me a comment. I’ll answer questions and covered missed opportunities for beekeeping know-how in future posts. Maybe they’ll be titled something like “Beekeeping 101”. The past few days have been a whirlwind for us. Jacob’s 30th (shh! don’t tell him I told you!) birthday was last week and was celebrated with a surprise party, we left for three days on our first vacation away from Beckett, Jacob started back to work on Monday after three months of unemployment, Beckett entered full-time daycare for the first time and the honeybees arrived. Phew! It makes me tired just typing it all. As soon as I got the phone call that the bees had arrived, I set about like a manic, pregnant women counting down the days till the baby pops. I began prepping their house and cleaning out old hive boxes. The pollen patties that had been stored were set to thaw on the counter. The pot was bubbling on the stove and sugar syrup was under way. I wanted to open every door for the girls and give them every opportunity to survive and prosper. The choice of where to place the hives was ridiculously difficult for me. During the years that I had honeybees they were housed at my mother’s home about five minutes from us. Her property is 40-acres of open fields and dense forests. The pollen sources available are varied and uniquely well rounded; there are snarled blackberry brambles, massive locust trees that touch the sky, gnarly old apple trees and dandelions as far as the eye can see. It is a wonderful home for honeybees. Our house and property are another story. We are blessed to have a good size lot and the room to house a handful of hives if we wanted. The last year I had honeybees, the hives lived on my land. One of my greatest joys with honeybees is the predictable rhythm of watching the bees go about their daily business. Our home is also a honeybee’s paradise; we are surrounded by hundreds of acres of raspberry fields. But, the bees only lived with me for one year. We lost them that winter. I don’t know what caused their disappearance, but there is overwhelming scientific evidence that points to the use of pesticides and other contaminants contributing to their death. Raspberries are notoriously one of the most chemical laden foods grown and our home is at the center of this death trap. Bees will travel up to three miles away in search of nectar and pollen, but my honeybees need not travel that far. Our nearest 80-acre raspberry field is a mere hundred feet away. That’s literally a hop, skip and a jump away. I cannot protect them from the environmental predators that surround our home. My mom’s house is a sanctuary in the country that offers enough pollen sources to keep the bees distracted and satisfied. Bees are incredibly efficient foragers and will not waste unnecessary energy flying great distances if their nearby home is stuffed with pollen and nectar. I cannot observe them in my garden or watch their daily interactions, but I have loosely draped them with a safety net of sorts. 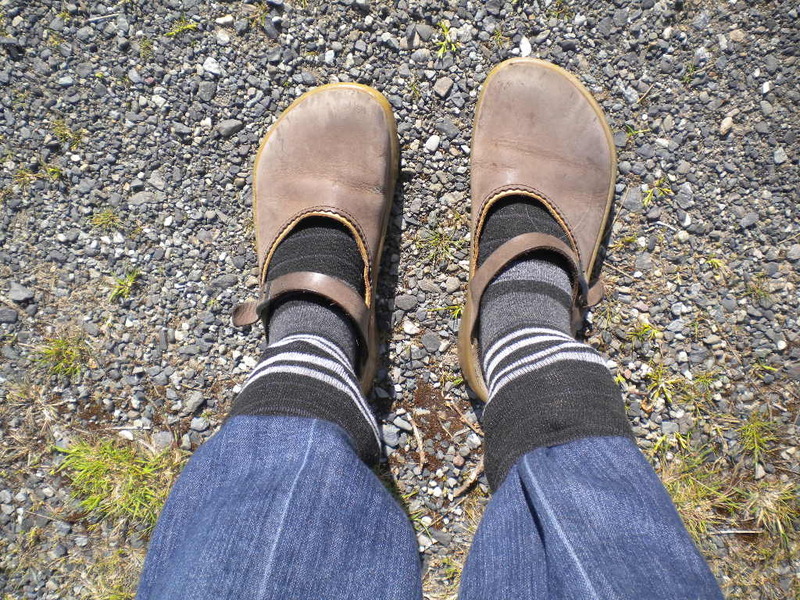 A beekeeper's feet - what a fashion statement?! The smokers a goin' - my tinder of choice is old blue jeans. They give off such a sweet smell. The boxes of bees were filled to the gills with buzzing insects. The middle of the box was adorned with the queen hanging inside a plastic cage and filled with a can of sugar syrup that could be accessed from inside. The bees had been housed together for over a week, subsisting on the sugar syrup, and had grown accustomed to the scent of “their” queen. 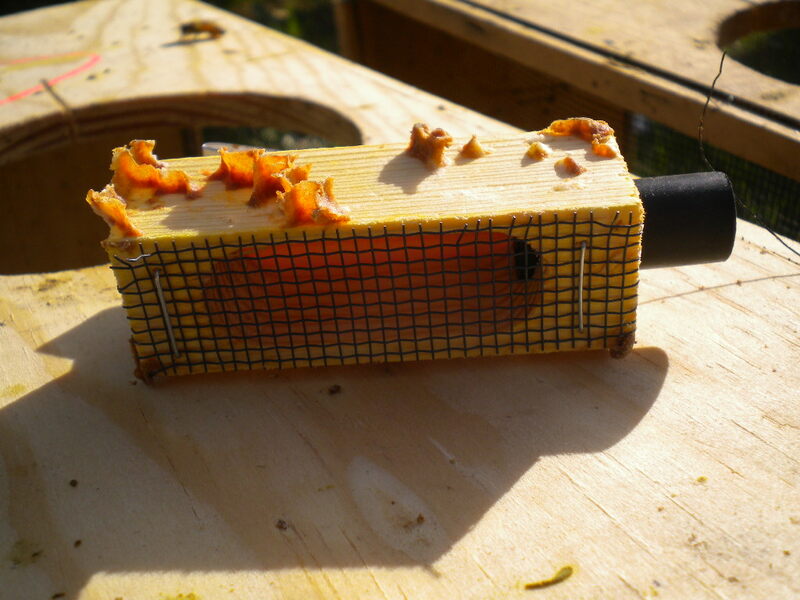 The transition to the hive involved removing the queen and her cage, replacing her protective cork with a sugar stopper and putting her into the new hive. The sugar stopper was intended to provide the worker bees with the opportunity to slowly introduce her to hive by way of eating through the plug and releasing her in due time. Once the queen was safely inside the hive, the bees were dumped in. With a solid thump and shake, the bees fell into the hive like a cascade of sticky marbles – one unit of buzzing dervishes. 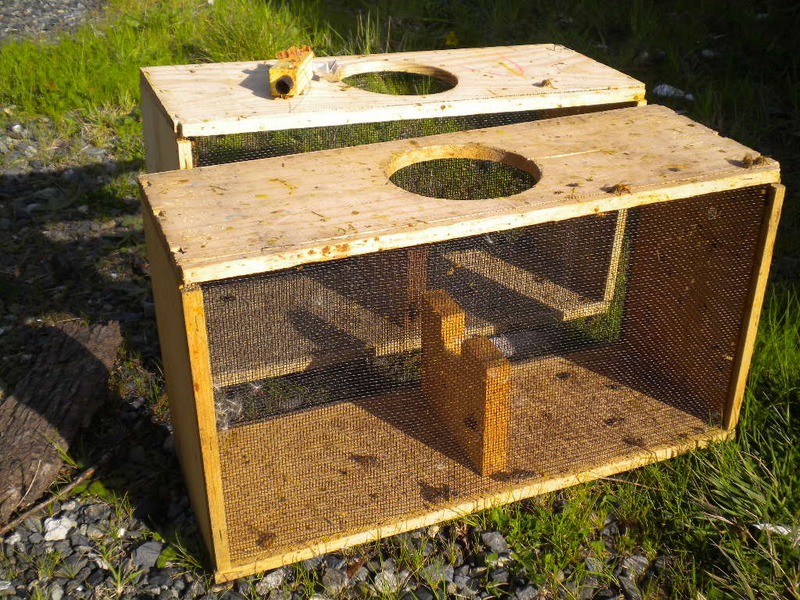 The queen's temporary home - she's all gone and now livin' it up laying 1,000+ eggs a day! The syrup feeder was filled. 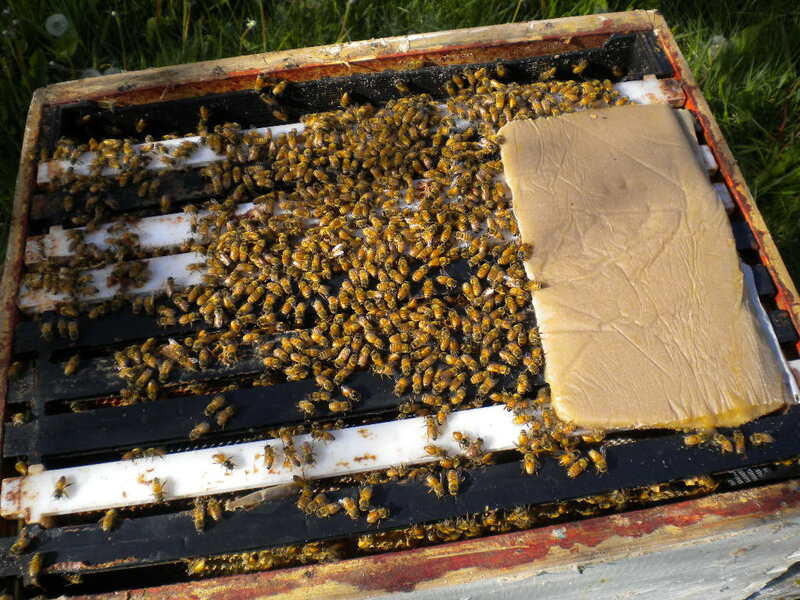 The pollen patty was smushed onto the frames. And, the hives’ lids went back on. Beekeeper Kate will stop by for a checkup later this week and make sure the queens have been released and are laying eggs. I’ll keep you posted. 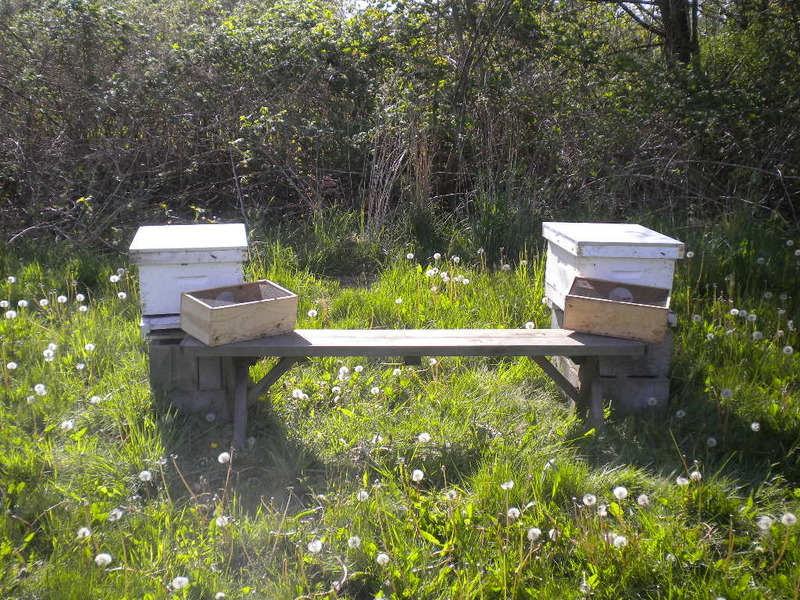 Everybody is all settled with the last few stragglers working their way from the boxes to the hives. 3 Responses to A new arrival…My BEES!! Dude, keep going with the bee stories and pictures, I honestly just read that blog like it was on fire I could not read or look at the pictures it fast enough. So seriously, please keep us updated as that is pretty cool stuff.